Every Sunday morning between 7:30am-3pm the flower sellers of London come to hawk their ware in this quaint little market on Columbia Road in London's East End. The road itself is pretty short, so you won't have to devote as much time as Portobello or anything, this is more about a leisurely stroll exploring the neighbourhoods art and craft vendors, and occasionally stopping to smell the flowers. During the warmer months this market fills up pretty quickly so it's best to come early around 7:30 or 8 am. With a strong to go coffee (or tea if you're in full on London mode) in hand you're ready to explore the market. 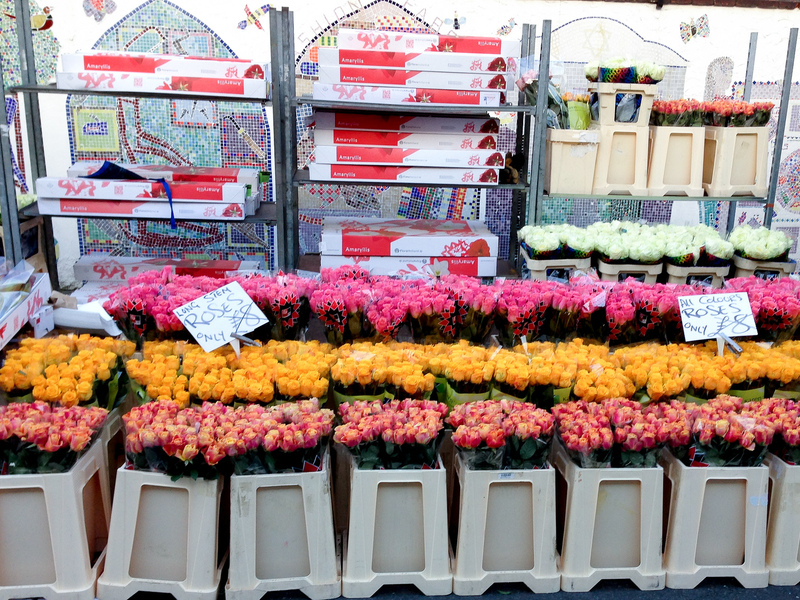 Although you'll spot a few tourists at Columbia Market, most often this place is packed with locals looking to pick up freshly cut flowers at bargain prices. There's a huge range of blooms here and all the prices are fairly cheap, so if you fancy a bouquet try out your haggling with one of the vendors. Most vendors will knock off a £ or 2 if you put on a good show, but they aren't hurting for business so you won't get them to half the price or anything. If you really want to score an amazing flower deal head over around 2:30 pm when the market is closing up and the vendors are trying to get rid of the last of their stock. The downside to this method is you might not get the prettiest bouquet, those tend to get snatched up pretty early. There's more than just flowers at Columbia Market, you'll also find a number of fantastic shops selling garden supplies, housewares, jewelry, artwork, secondhand books and accessories. There's also a few cafes such as Cafe Columbia where you can pick up a bagel or get a refill on that coffee when you run out—yes, Sunday morning calls for many, many cups of coffee.